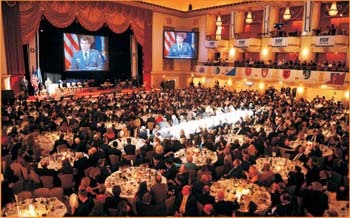 The audience at the 2010 Annual Dinner of the Friends of the IDF addressed by Lt. Gen. Gabi Ashkenazi, Chief of Staff of the IDF. $20 million was raised during the Gala. Prime Minister of Israel, Benjamin Netanyahu, was host to US Veep Joe Biden but still managed to send a video message to the 1400 people attending the FIDF [Friends of the Israeli Defense Forces] Annual Gala at the Waldorf Astoria in New York. Netanyahu said that Israel was open to peace talks with Syria and that if leaders of the Palestinians and Syrians are genuinely committed to peace we will make peace. "If they are sincere, my hand and the hand of the people of Israel will reach out for peace," he said. But he added this must be based on the acceptance of Israel and its security. In discussing Iran's open threats against Israel, and his concern about an Iranian army with nuclear weapons, he called for UN sanctions with teeth including those on the import of gasoline into Iran and the export of oil out of Iran. He added a personal note by reminiscing about his days as a combat soldier during the War of Attrition [which followed the Six Day War from 1967-1970]. He was involved in a firefight across the Suez Canal and lost a close friend. He visited his friend's family and met his mother, a survivor of the camps, whose son was born shortly after the camps were liberated. He still recalled her words � "as long as my son fell wearing the uniform of a soldier rather than a victim of the camps, that makes all the difference." From left: Founder and Pres. of Int�l Fellowship of Christians and Jews (IFCJ) Rabbi Yechiel Eckstein; Lt. Gen. Gabi Ashkenazi; Friends of the IDF National Dir., Maj. Gen. (Res.) Yitzhak (Jerry) Gershon. Benny Shabtai, did an incredible job, as always, raising over $20 million for the evening. The attendees were pumped by a $4 million donation by the International Fellowship of Christians and Jews founded by Rabbi Yechiel Eckstein. 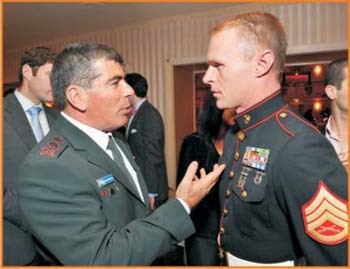 But the person who touched the crowd the most was US Marine Sergeant Todd Bowers, just back from a tour in Afghanistan, [who is not Jewish], who donated $1000 in honor of slain Israeli hero Liran Banai. 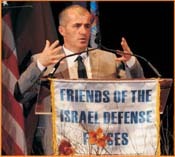 Lt. Gen. Gabi Ashkenazi, the keynote speaker, said he stood there today as Chief of the IDF, as a man who lost many friends in Israel's wars, as an Israeli citizen and as commander of Israel's armed forces. He spoke of Israel's democratic respect for human dignity and human life and pledged that "we will win over those that seek our destruction." He lauded Israel's response to the disaster in Haiti recalling that over 300 lives were saved, 16 babies delivered including 6 premature and one not quite 3 pounds named Yisrael in honor of the Israeli doctors. Gabi remarked, "I'm always prepared to fight to save the homeland, but I would much prefer to fight for newborn babies' lives." Excerpts of the General's speech are included in a separate article. 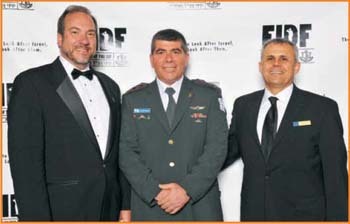 From left: Jack Lahav, former FIDF President greeting IDF Chief of Staff, Lt. Gen. Gabi Ashkenazi. Monica Crowley, radio talk show host and perennial MC introduced via satellite the heroes of the naval operation this past November wherein a commercial vessel disguised as an Aid ship flying an Antiguan flag was boarded in treacherous seas and hundreds of tons of weapons, missiles and explosives meant for Hezbollah were uncovered. 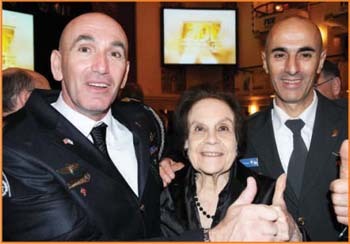 The firsthand account by Admiral Roni Ben-Yehuda, Naval Chief of Staff along with an Israeli Navy Seal reporting from Haifa, mesmerized the audience with their description of their heroic encounter. They had knowledge that a shipment was in transit from Iran to terrorist organizations and it took a full week to find this ship, which they described as looking for a needle in a haystack. When they found a ship that met the profile they had one hour to get to it under waves as high as 22 feet, follow international protocols, board the vessel, ask the Polish Captain to search the cargo with trained dogs who kept barking until crates of rockets and explosives that would supply weapons for a month of intense warfare were uncovered. It was described as the mother load and was so dangerous to transport that all lives on board were in constant danger during the reckless journey, which apparently meant nothing to Iran. What an amazing story! 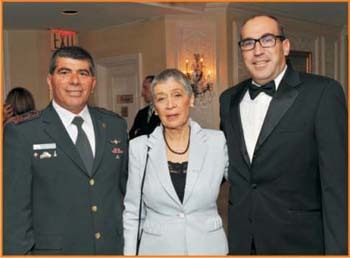 From left: Lt. Gen. Gabi Ashkenazi; Permanent Representative of Israel to the UN, Gabriela Shalev; and Israel�s Consul Gen. in NY, Assaf Shariv. The most touching portion of the evening, that had many in tears, was the story of Staff Sargeant Liran Banai. Liran's parents are deaf and unable to talk. He was their voice and ears, and as such was exempt from military service. Notwithstanding, he asked them for permission to be a combat soldier at the age of 18 and they agreed. On his last visit home, his parents noticed he had changed, that he had an inner glow. Then came the day when Palestinian terrorists attacked his IDF jeep on the Gaza Strip border and a bomb decimated the tall, rugged and handsome Liran. He lost both legs and a great deal of blood. For three days his parents, Guy and Gila, and the entire nation prayed for him and on March 8, 2008, two years ago, he died. His father, communicating through a sign language translator said, "I miss his hugs and smile and strength. I do not know how I was able to live without him. Liran was our life. But in this moment I am proud of Liran, proud of our soldiers, proud of our army and I want to thank you for your support for the State of Israel." Liran's sacrifice was responsible for so many people increasing their donations to the FIDF to show their appreciation for him and his family. 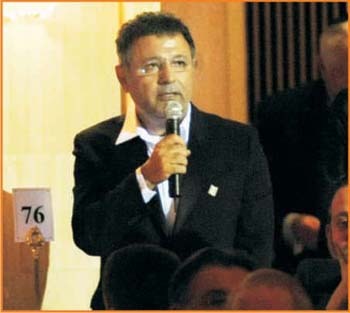 Funds raised were to provide much needed and well deserved services such as financial support to soldiers in need and lone soldiers, academic scholarships to former combat soldiers, weeks of rest and relaxation for entire IDF units, as well as cultural, educational and sports facilities. It is also a way to pay tribute to the IDF and send a message of love and support to the brave men and women in uniform. Luxury Fashion Designer, Elie Tahari. Michael Miller, JCRC Executive Director, is well protected. Bereaved Israeli father, Guy Banai, told the moving story of his departed son, Liran Banai. Benny Shabtai (left), with his attractive family. 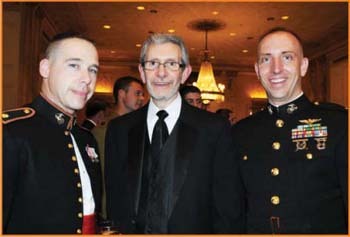 Lt. Gen. Ashkenazi, with US Marine, Sgt. Todd Bowers, who returned from Afghanistan and donated $1,000 in memory of Liran Banai. It�s two thumbs up for Gloria Starr Kins. A young couple who came to show support to the IDF. Two IDF female soldiers became an attraction to the Americans in the audience. Monica Crowley, radio talk show host and with elite commando unit Sgt,. Tal Shabbat, who survived being shot in the head in Gaza.